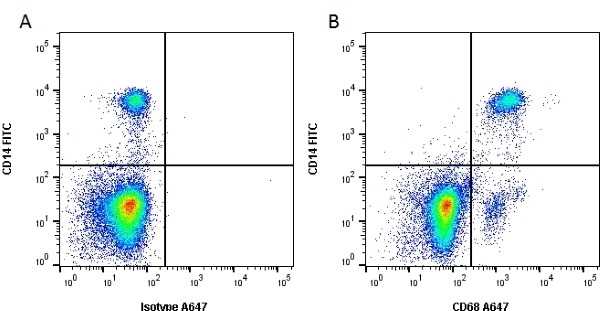 Mouse anti human CD68 antibody, clone KP1 recognizes the human CD68 cell surface antigen, a ~110 kDa glycoprotein primarily expressed by macrophages and monocytes. Reconstitute with 1ml distilled water. 1 Membrane permeabilisation is required for this application. LeucopermTM (BUF09A) is recommended for this purpose. 1Membrane permeabilisation is required for this application. 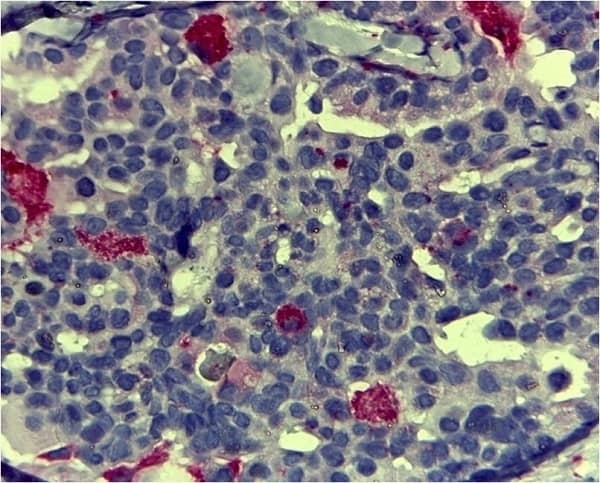 LeucopermTM (BUF09A) is recommended for this purpose. 1Membrane permeabilisation is required for this application. Leucoperm™ (BUF09A) is recommentded for this purpose. 2This antibody requires heat-mediated antigen retrieval prior to staining paraffin sections. Citrate buffer, pH6.0, is recommended for this purpose. 1Membrane permeabilisation is required for this application. Leucoperm™ (BUF09A) for this purpose. Pulford, K.A. et al. (1989) KP1: a new monoclonal antibody that detects a monocyte/macrophage associated antigen in routinely processed tissue sections. J Clin Pathol. 42 (4): 414-21. Xiao, J. et al. (2016) Effects of ketanserin on experimental colitis in mice and macrophage function. Int J Mol Med. 37 (3): 659-68. Masaki, T. et al. (2004) Activation of the extracellular-signal regulated protein kinase pathway in human glomerulopathies. J Am Soc Nephrol. 15 (7): 1835-43. Vroon, A. et al. (2007) Neuroinflammation in Parkinson's patients and MPTP-treated mice is not restricted to the nigrostriatal system: microgliosis and differential expression of interleukin-1 receptors in the olfactory bulb. Exp Gerontol. 42 (8): 762-71. Schwarz, F. et al. (2016) Human-specific derived alleles of CD33 and other genes protect against postreproductive cognitive decline. Proc Natl Acad Sci U S A. 113 (1): 74-9.